Cool down and help tame over-worked tummies in style this 4th of July with this tri-banded patriotic smoothie with Calmful Gut. It combines three of our favorite summer smoothies into one deliciously cool treat. Prepare each smoothie recipe substituting the recommended CALM product, for Calmful Gut. Don’t fret if your Calming Coconut Dream Smoothie is a little thick, this consistency will help to hold the visual effect together. Finally, when each recipe is ready, layer about 2oz, or a quarter cup of each smoothie alternating between white and berry smoothies to create a banded effect. 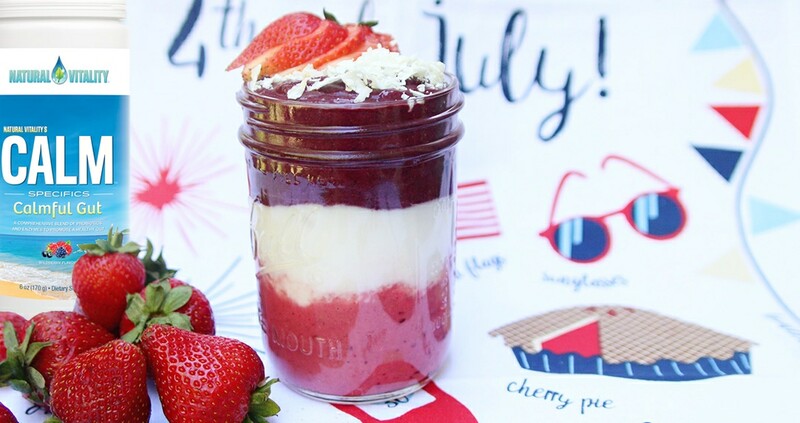 For added drama serve in small mason jars, top with coconut shreds and sliced strawberries. Enjoy!